It’s the last day of 2014 and WordPress apparently expects me to want to post a blog entry summarizing my year. They sent me year-end stats, but they aren’t very meaningful to me because I started my blog on my fifty-ninth birthday, so my blog year runs from February eighth to the following February seventh. If I have any summing up to do, that will come in February. I have a lot of painting to do before then. My blog goal for this year is to complete fifty paintings. I have completed thirty. I’m going to be doing a lot of painting in the next five weeks. I will also be inventorying the tie-dye and getting all our paperwork ready for tax season. I don’t even want to think about that right now. I do have a New Year’s Eve tradition. It’s based on my daughter’s tradition of spending New Year’s Eve alone with her husband. I help make that happen by hosting the other members of her household here. 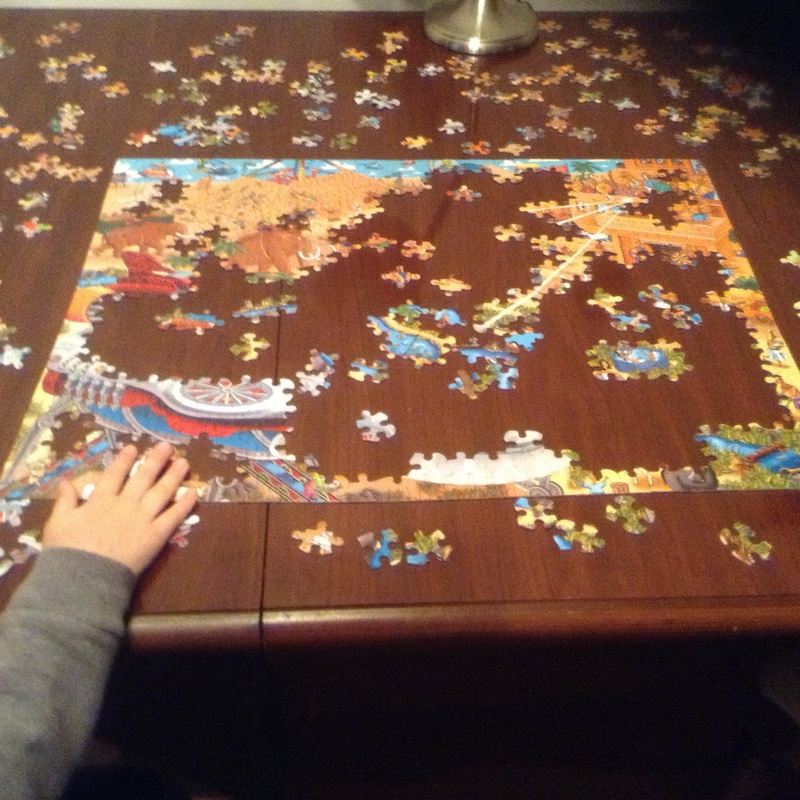 One part of our tradition is to do a puzzle. If we finish it by Midnight, we get good luck for the whole year. Everybody helps, but my son and I tend to do most of the work. We’re jigsaw puzzle people. My grandsons hang up their stockings on New Year’s Eve. That’s a tradition that comes from my father’s family. It’s what my siblings and I did when we were young and I passed the tradition on to my children and grandchildren. I once asked them if they’d rather do it on Christmas Eve like their friends, but they said they liked our tradition. It stretches out the holiday. It also stretches Santa’s budget, so it’s a win all the way around. We will stay up until midnight. We will finish our puzzle. We will turn on the TV and watch the ball drop in Times Square. Then my husband will go outside and shoot off some sort of (mostly legal) fireworks. No one will notice our little sparklers because the neighborhood sky will be full of fireworks, most of them clearly not legal in this state. It’s not a long drive from North Florida to South Carolina, where you can buy all kinds of fireworks in all kinds of crazy fireworks stores just across the border. Not that we’ve ever done that or anything. I can already hear some pretty big bangs out there. They’re starting early. It’s only seven o’clock. They will save plenty of big booms for midnight, I’m sure. Once they finish making all that noise, I will settle my young guests on air mattresses and we will all try to get some sleep before getting up to check those stockings and get ready for a lunch of black-eyed peas and collard greens. That’s for luck and prosperity in the new year. I tried to get my teen-aged grandson to eat some last year, but he declined. I tried to convince him to do it for luck, but he said he helped with the puzzle the night before, so he had all the luck he needed. Maybe that works for him, but I intend to cover all my bases. This entry was posted in Uncategorized and tagged jigsaw puzzles, lucky foods, New Year's Eve, painting, traditions on December 31, 2014 by releaf1954.